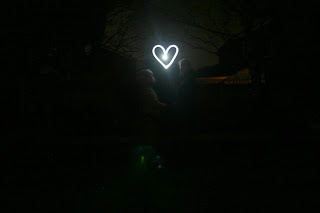 A few weeks ago, one of the activities the young women had wanted to do was to play about with some light photography. Unfortunately, that evening the young woman who was going to teach us, was unable to attend and we only found out moments before the activity started. So, we decided to press on with my rather limited knowledge of long exposure photography. The girls and us leaders had a blast, so much so that this past Sunday evening, I managed to get the entire family out into the back garden to have a bit of a play with light. It was hilarious and we all laughed, giggled and got out of breath running around the garden whilst we wrote names and short words, and all the time remembering to write the words backwards, although in the case of Flyfour not always remembering the amount of space one needed! We drew pictures, drew around each other, tried to draw the cats, tried to draw around the cats. Played with glowsticks, looked at the stars for a bit, went back to running around the garden like lunatics, whilst our neighbours probably looked out of their darkened windows thinking "What on earth is PippaD and her family doing?" We got this cool picture of Dan Jon and Top Ender, with me running like a lunatic around behind them trying to ensure I'd traced all around them and trying to make sure that you couldn't see me! Top Ender got Dan Jon doing the YMCA (Y is shown below!) and we decided that instead, it looked a bit like he had just had his Readybrek that morning. Which made us all feel super cold and fancy some Readybrek. Before we went in to warm ourselves back up there was something I wanted to do. I positioned the children in the middle of the garden. I got Flyfour on the Camera and did a small simple heart between the heads of my two lovely children. I wanted this image so that I would remember in years to come that they did love each other. I wanted it so that they would remember now that they do love each other. I wanted it because these two are actually my heart, along with their Daddy of course, and I wanted something to show it. The children are already talking about doing something similar in the future as gift ideas for friends and family, about learning even more about how to use the DSLR's we have and perfecting the timing of exposure and even trying things like Sparklers and Fireworks. I'm just pleased we all had some fun together.